I was riding towards the fence and powerless to change the direction I was going in. There was only one way this was going to end and it wasn’t going to be pretty. This is one of my first memories of riding my first two-wheeler bike. The reason I couldn’t steer the jolly thing was because of the trainer wheels at the back not allowing steering to be very easy at all. Luckily I wasn’t going too fast, but I did come off the bike. Boy, I hated those trainer wheels but I was really reluctant to let go of them. 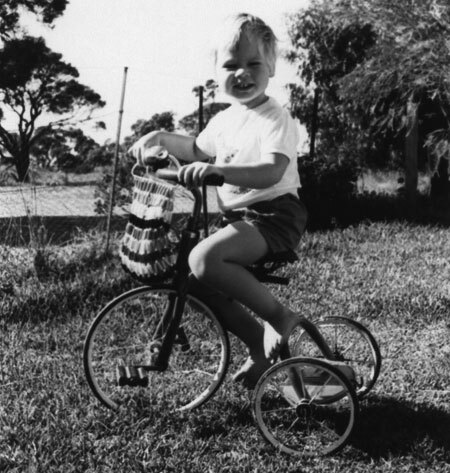 Growing up on a farm and having a bike go hand-in-hand. You can ride around to your heart’s content and there’s a lot of area that can be covered on most farms, including the one I grew up on. It also made getting from A to B a lot faster. We had a bit of scrub-land that had tracks through it which were perfect for riding bikes through. This meant we could ride right through the property to the next road and it afforded a lot of freedom that my son growing up in the city just doesn’t have. After rains we could ride through puddles, in fact a puddle wouldn’t be missed. The splash of mud and water was quite exhilarating and I’m sure that mum just loved washing our mud-soaked clothes. Actually I don’t remember too many complaints from her, probably because we were out of her hair and I only say that because time away from your kids is just as precious as time with them. Even when we visited friends who lived in a large town one hour away we’d spend ages riding around the town, again something that my son might never get to do. Although when I visited my sister who lives in a smallish country town I let my son go around the block on his scooter with his cousin. They were under strict instructions not to cross any roads etc etc and when they hadn’t come back in the time I expected them to I went searching for them. Of course they were fine. These days I live in a city and am too scared to ride my bike amongst all the traffic. My son, however, has learned how to ride a bike with as many mishaps as I did. I bought a cheap bike a couple of years ago to go riding with him but the bike sits there collecting dust and cobwebs outside because of my scardeycatness. The one day I did go out for a ride I nearly got collected by a car in a local street – a back street. It wasn’t too long after the bike in the fence incident that I let dad take the trainer wheels off and had a go at riding without them. Of course he had to run along behind me, therefore I’d replaced the trainer wheels with my dad. Only one day I was riding away and when I stopped and turned around dad was standing back where I’d started. I finally realised that I didn’t need my trainer wheels or my dad to ride the bike. And you know what they say, once you’ve learned how to ride a bike you never forget. Oh, and the image at the top was probably my first bike. I just don’t really remember it. As well as for the memories, this post is for Scribbit’s Write-Away contest. Riding around a farm must be the best place to ride a bike–I can just imagine how fun that must have been. Michelle, did you notice the handbag accessory I had? It was fun riding around the farm. I’ll never forget it. Nothing like doing skids on the gravel roads in my memory!! Wow, to have the freedom to ride around a farm. How wonderful to have so much room to roam and ride. I love the picture- especially the proud smile you’re wearing. Thanks Chasity. I’d never noticed my proud smile before. And it was absolutely wonderful to have the freedom to ride around at will like we did. Mozi Esme’s Mommy – I wish my son had as much freedom to ride around as we did too. He’s growing up in the city though and it won’t happen here.